Product prices and availability are accurate as of 2019-04-14 05:37:40 EDT and are subject to change. Any price and availability information displayed on http://www.amazon.com/ at the time of purchase will apply to the purchase of this product. Coffee Lab is an innovative New York City based single serve coffee company. We explore new flavor options sourcing the finest ingredients and new flavor profiles for single serve coffee makers. Our line of coffees are compatible with Nespresso® machines*. Inspired by a range of Italian desserts that are sure to delight your palate. Coffee Lab capsules are individually sealed to ensure maximum freshness and perfect coffee every time. Our flavoring process is 100% natural with no chemicals or sweeteners added. Gourmet coffee sourced from South Africa, Guatemala, and Brazil to create the perfect cup. *Coffee Lab is not affiliated with, endorsed or sponsored by Nespresso. Nespresso® is a registered trademark of Societe des Produits Nestle S.A. Coffee Lab is not affiliated with Coffee Labs Roasters, Inc. 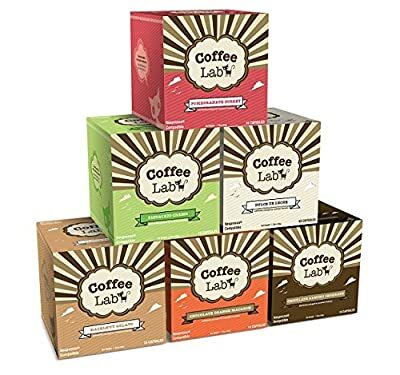 Try the full line of gourmet flavored espresso from Coffee Lab: Pistachio Creme, Magic Berry, Dulce de Leche (Caramel Cream), Hazelnut Gelato, Chocolate Almond Croissant, Chocolate Orange Macaron Twelve boxes of Coffee Lab a brand that is compatible with Nespresso Machines: 10 capsules per box; 120 capsules total Coffee is roasted in Italy and enriched with 100% natural flavoring extracts with no added sugars or sweeteners No calories, vegan, gluten-free, no artificial flavors, soy-free, no preservatives, 100% recyclable Not Associated With Coffee Labs Roasters, Inc.